Portland’s public toilets have succeeded where others failed. The secret is in the design. 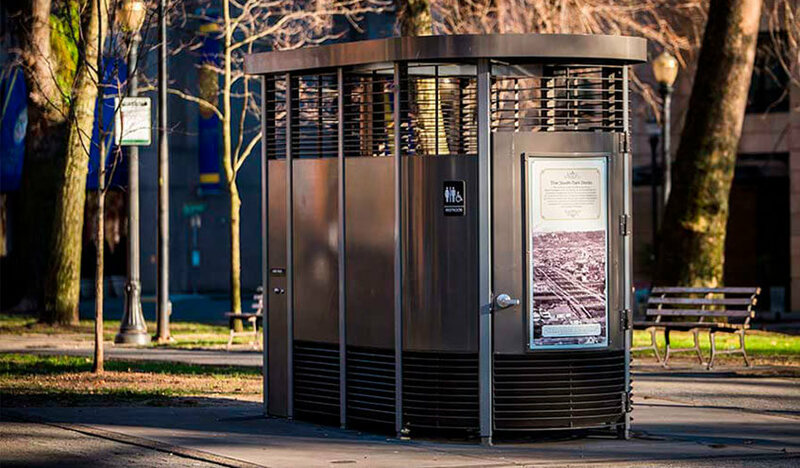 The Portland Loo was designed with the primary intent to prevent problems that are commonly experienced with public toilets, such as crime, vandalism, and deterioration. This freed the Portland Loo from becoming a beaten-down haven for illegal activity, while also enduring wear and use over time. The Portland Loo is constructed of materials that last! Initially installed over 10 years ago, the first one still looks new today. The innovative shape and presentation integrates beautifully with the city environment. The design is more than it appears. The Loo is attractive and durable, but it’s functional too. The coated stainless steel walls are sleek and modern, which also makes them hard to vandalize and easy to clean. Nothing can be ripped off the walls or damaged, because the hand-washing station is mounted on the exterior. The design is done for you. All this has already been built into the design, which means you don’t have the legwork or expense to design your own. It’s fabricated off site, and can be delivered on site completely assembled. The Portland Loo is made with few materials, making it less expensive to construct. It requires minimal utilities that can operate on solar power or low level volt power. And, the components are commonly used by cities around the world, so they’re easy to replace or upgrade. Read more about the features of The Portland Loo design below. Louver grating at the top and bottom of the bathroom wall create an interior environment that offers complete visual privacy, while remaining as connected with the outside as possible. These louvers are angled in such a way that doesn’t compromise privacy, but does allow law enforcement the ability to observe the number of users inside. The unit’s hand-washing station is mounted on the exterior, which promotes quicker turnaround time, serving a higher pedestrian population. The restroom was designed with Crime Prevention Through Environmental Design by using high traffic areas and visibility to deter illegal activities and generate high usage rates. Each Loo is built to fully comply with ADA Standards. The unit is composed of a minimum of materials. Utilizing stainless steel for the structure means that the Portland Loo weighs a fraction of a typical restroom, and can be delivered on site as a complete enclosure. The modular construction of the restroom allows for it to be quickly removed during flood conditions or easily repaired onsite. Protected with an anti-graffiti clear coat, the restroom can take a lot of abuse, and is easy to maintain with a cleaning hose and janitorial supplies stored in the mechanical closet. The Loos in Portland are available to the public 24/7, taking the strain off local business, and creating a welcoming environment for families. The entire unit can be off-grid and lit entirely by solar-powered LED fixtures. The restroom can be pre-wired for 115 volt AC power or powered by a hybrid system of solar and AC. At night a gentle light washes the exterior until it is occupied, at which time the interior lights activate and the exterior lights dim, announcing that it is in use. The Loo is functional year round with all exposed plumbing and toilet bowl wrapped in heated wire for freeze protection. The restroom requires minimal utilities, at 1.28 gallons per flush and a max 60 watt load. Fitted with an occupancy counter the restrooms in Portland often average 250 flushes per day, equivalent to busy airport restrooms. For more specific measurements and component features that are used to build The Portland Loo, view our Portland Loo Specs document.